South Korea's Yonhap news agency quoted a source as saying the colonel was seen as elite by other defectors. Last week, 13 North Koreans who had been working in one of the North's restaurants abroad defected as a group. "He is believed to have stated details about the bureau's operations against South Korea to the authorities here," said the official. 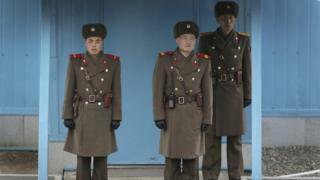 The BBC's Stephen Evans in Seoul said such a figure would likely have valuable information about the workings of Kim Jong-un's government. For most North Koreans it is almost impossible. The borders are heavily guarded and few people have the resources to fund an escape. Those who do make it out usually cross the river borders into China. They either lay low to avoid being sent back by China to face severe punishment, or try to reach a third country. There are many cases of diplomats, athletes, musicians and others defecting and claiming asylum while representing North Korea in other countries. Some border guards have simply walked away from their posts. Relatives they leave behind are almost certain to face persecution or jail. How many senior North Koreans have left? Numbers are not widely available but dozens of senior level officials are thought to have defected in the past few years. The most high-profile defection to date was Hwang Jang-yop, a politician who was considered the architect of North Korea's policy of "juche", or self-reliance. He claimed asylum at the South Korean embassy in Beijing while on a work visit in 1997. He died in 2010. About 29,000 people have defected in total since the 1950s, though numbers have fallen in recent years. How does South Korea treat defectors? Any North Korean who makes it to the South enters into a rehabilitation programme and is given an aid package to help them start a new life. Despite this, many find it hard to adjust. High-level defectors are questioned closely for valuable information, and to ensure they are not acting as double agents. South Korea denies North's Korea's accusations that it is enticing people to defect.